How to make your Sock Monkey! 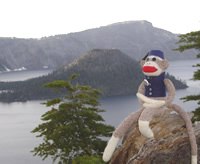 There are hundreds of ways to create your own Sock Monkey. Two of the most popular styles are the Vintage Style and the New Style. Below are instructions on how to make those two styles. The true vintage pattern was released around 1920 and is still used today. The vintage pattern is most easily recognized by a long tail. The new pattern was released around 1970 and was quickly adopted as the standard Sock Monkey design.